Police yesterday arrested two suspects for allegedly stealing pants at the Mission House of an orthodox church in Akure, the Ondo State. 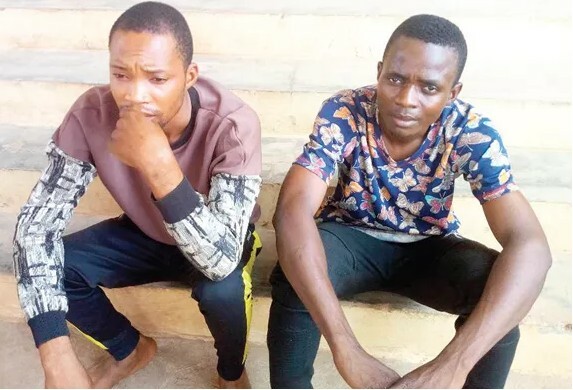 The suspects, Samuel Linus and Adekunke Ogundana, who were security guards posted to the church, were said to have stolen the pants of a daughter of the venerable of the church spread overnight. However, the suspects said they were not aware of the stolen pants as they were not allowed into house where the pants were spread. Also, in the early hours of yesterday, the Joint Task Force set up by the state government arrested seven suspected kidnappers at Emure junction via Owo where they gathered together in a suspicious manner. Some of the items were recovered from them, according to Joseph, were 16 locally-made guns, 17 cutlasses, 13 knives, seven handsets and N27,820. cash. They also have some food items and pieces of clothing and items suspected to be charms.